Foot and ankle pain is a… well… it’s a pain, but having the right pair of shoes can go a long way to helping reduce and relieve your symptoms. New Balance have been making shoes for over a century, starting out as a company with the sole purpose of providing people with proper arch support, who needed to be on their feet all day. They then moved to creating their own athletic products and running shoes to become one of the world’s major sportswear companies. New Balance are also well-respected by doctors and podiatrists as they have carried on their goal of helping people who need additional support for their feet. People who suffer from Plantar Fasciitis or heel pain welcome a well-fitting shoe. New Balance have some excellent models that work towards helping, due to their motion-control (to stop over-pronation) and technological advances in foot support. This men’s running shoe is one of their more feature rich products, and is one of the best new balance shoes for plantar fasciitis, designed for the serious runner in mind. The MR1225 running shoe is made using lightweight synthetic and mesh materials and the rubber sole has been designed to reduce any shock to your foot and ankle, which means less chance of injury for you. New Balance seem to have gone the extra mile to make the MR1225 great for people who need additional foot support – which is great news for those of us who suffer from Plantar Fasciitis. This running shoe has a few special features, the first of which is “Stabilicore” which is their term for a special moulding support system that gives a consistent run. Stabilicore means that your foot is not going to be twisting or pronating at funny angles, causing pain and discomfort. The Stabilicore will ensure that you can walk or run with confidence that you will not be causing yourself any additional problems from bad posture or poor gait. The second feature for the New Balance MR1225 that makes it a great running shoe for plantar fasciitis sufferers, is the additional midsole and arch support. This is provided by both some ABZORB FL foam and their Stability Web. The foam provides the cushioning needed to help protect your foot from vibration and shock, whereas the Stability Web gives better support around the arch of your foot, where plantar fasciitis pain hits most people worse. Like with most other New Balance running shoes, you are able to lace them up very snugly, which I have found helps reduce any slippage inside the shoe. If your shoes do not fit properly, it can lead to foot and ankle over-pronation, which will lead to problems longer-term. Made from excellent modern material. Designed with optimal foot and arch support in mind. Good support around the heel area. Recommended by some foot doctors. The heel area is glued on, which some people have reported can come loose from over-use. Some people report the toe-box area as being too small or cramped. Buyers report that the arch support could be better. 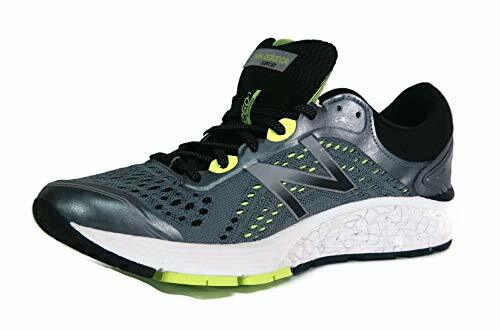 These NB running shoes are known as “stability shoes” or “motion control shoes” because they have been designed not to flex, providing additional support to keep your foot straight in the shoe. The MR1123 has been designed to use a Rollbar TPU posting system which will help to reduce any movement from the rear part of your foot. This helps to provide the excellent “motion control” benefit which will help reduce foot and ankle pain. As with the previous shoe we reviewed, the MR1123 also have the ABZORB FL midsole foam to help keep your foot cushioned and supported. For people who suffer from foot or heel pain, any additional comfort we can get will be useful. New Balance have also included the ABZORB SBS feature in their MR1123 shoes too, which helps to reduce any shock from walking and running. If you run when you have plantar fasciitis or foot pain (as I do…) it helps to have a shoe that is as gentle on your feet as possible. The SBS helps to reduce any jarring or compression from your movement, which will help keep your feet and ankles more pain-free than a normal pair of shoes. These sneakers are not the best looking products on the market, but they are very practical, lightweight and are made from the usual mesh, rubber and synthetic materials that other New Balance shoes use. They might even be the perfect pair of trainers to have for everyday use, even if you are not into running. Great shock absorbing foams and technologies. Good “motion control” to help reduce over-pronation. Work well with additional orthotics for additional arch support. Their look might not appeal to some people. Some people report that they don’t have much additional arch support. May be too wide for some feet. Some people find them bulky to wear despite their material. The MX1012 is advertised by New Balance as a “cross training shoe” – so not necessarily designed to be used (in anger) when you are out running. If you have plantar fasciitis or foot pain, these may not give you quite the stability or support you need without some additional orthotics. Not to say that these are not comfortable and cushioned shoes – many people have said how well they fit and feel during exercise classes and when they are out walking. As with most New Balance shoes for plantar fasciitis, they have a good quality midsole system, which has been designed to reduce both impact and give extra stability to prevent your foot from twisting or pronating. The ew Balance MX1012 shoes don’t come with extra technological features to help with your foot support and are made from fairly meager materials too. So – why have I included this as a good buy for people with Plantar fasciitis? Because the MX1012 is a no-frills all-rounder athletic shoe that is great for people who are not runners. New Balance are most well-known for making running shoes, but the MX1012 will be great for people who go the to gym or want to use them for general fitness activities. They would not look out of place on the tennis court or on a long-walk. Made from versatile, lightweight and practical materials. Good ventilation from mesh materials. Provided insoles can be removed and replaced with orthotics. Not much additional arch support. Sizes may come up small and narrow. Some complaints of bad materials and construction. Shallow and narrow toe box area. This running shoe from NB is quite basic, both in looks and features. Compared to our top pick, the MR1225 we reviewed at the top of this page, they seem quite boring! However – they are not totally impractical for foot and heel pain sufferers – and sometimes having a more demure looking shoe can be good if you want to wear them to lots of occasions (for example, I bought a pair of dark hiking boots for when I am working in the office so that I could wear my orthotics). Like some of the other running and training shoes, the MR993 also use the ABZORB cushioning system that will give you good support and cushioning. Add to this the use of Dupont Engage and Isoprene rubber for the main sole area and you have a quality, sturdy and supportive shoe, great for foot pain sufferers. 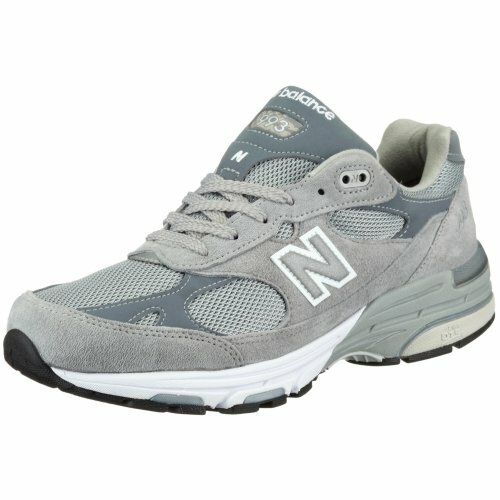 One thing that some people might like the MR993 New Balance shoes for is that they are made in the US. If you read some of the comments on Amazon for this shoe, it is clear that people have specifically chosen these because they are made in USA, believing that ones made off-shore are more prone to falling apart. New Balance even have a “USA Collection” where the shoes on sale are only made and assembled in the US. They also have sections of their website where you can filter out any shoes that are part-assembled in the US or made outside. I am not sure if this makes a difference to me – but I know a certain new POTUS that would be happier buying these shoes. Good cushioned support for bad feet. Simple colors available – good for wearing all the time. There are some reports of bad manufacturing – the heels coming apart. People say that the sole can wear down quickly (depending on usage probably). So, to wrap up this review of the best New Balance shoes for plantar fasciitis and heel pain, these 4 shoes are our recommended buys. Make sure you read the reviews of each, noting any possible issues with the sizing, width and fit. There are quite a few people who don’t and end up having to return the pair as they are too small.